I'm not much of a spring bulb fan. 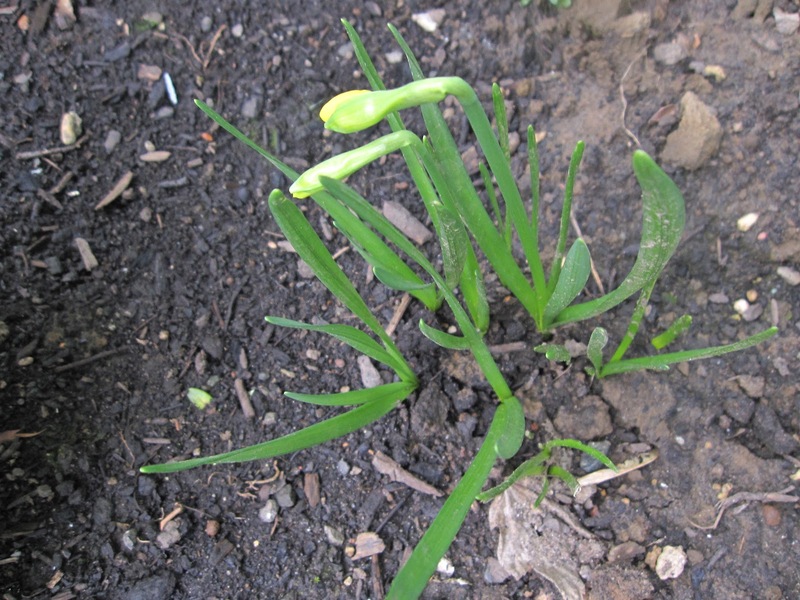 Actually, I like the little or offbeat spring bulbs, like snowdrops and Persian tulips. It's the huge King Alfred daffodils, massed armies of hyacinths and the garish Dutch tulips on steroids that I don't really care for. So last year at this time, I was looking at posts on Linda's whatsitgarden blog and wishing I had some small species tulips in my garden. Tulipa hageri x aucheriana 'Little Princess' filled the bill. I bought some online and tucked them away, as usual forgetting about them completely until late in the year. I was cleaning out the garden room some time in November and found them, along with several Camassia quamash bulbs I ordered at the same time. In desperation, I looked for any sunny spot to plant them and pretty much threw them into the soil. Records? Planting location? Ummm, no, I didn't make any notes. So what do you think these are? From their location in the Northwest Territory, I'm hazarding a guess they may be the Camas emerging. What do you think? Do these look like Camas sprouts to you? I had several pots of Ornithogalum, known as Star of Bethlehem, a South African bulb I bought from New Seasons at Easter time. When I researched them, it seemed worth taking the chance and planting them out in the garden. Whether it was our mild winter (so far) or the bulletproof nature of the bulbs, they (I think it's them, anyway) are peeking out now. They usually flower in summer, as I remember. Of course, that would be summer in the southern hemisphere, so all bets are off after forced flowering last Easter anyway. Do any of you know Ornithogalum? Does this look like it might be them? I feel slightly more confident about the location of the aforementioned 'Little Princess' tulips. My confidence is boosted by the buds I see forming in the centers of the bulbs. This looks like a tulip flower bud, right? Of course, it would be nicer if it got a bit of a stem, but I'll settle for tulip flowers growing straight out of the ground at this point. This last group is a dead giveaway because of the distinctive buds. It was a pot of Narcissus 'Tete a Tete' someone gave my dear old dad last year, that I tipped into the ground in late November. I'm not crazy about them, but I just didn't have the heart to toss them on the compost. At least they are the tiniest daffodils you can get. So one out of four is my embarrassingly low ID count for spring bulbs. And if they actually produce flowers and I can positively identify them, I promise myself I'll record the locations. Yep, this is the year I'm really going to get organized. 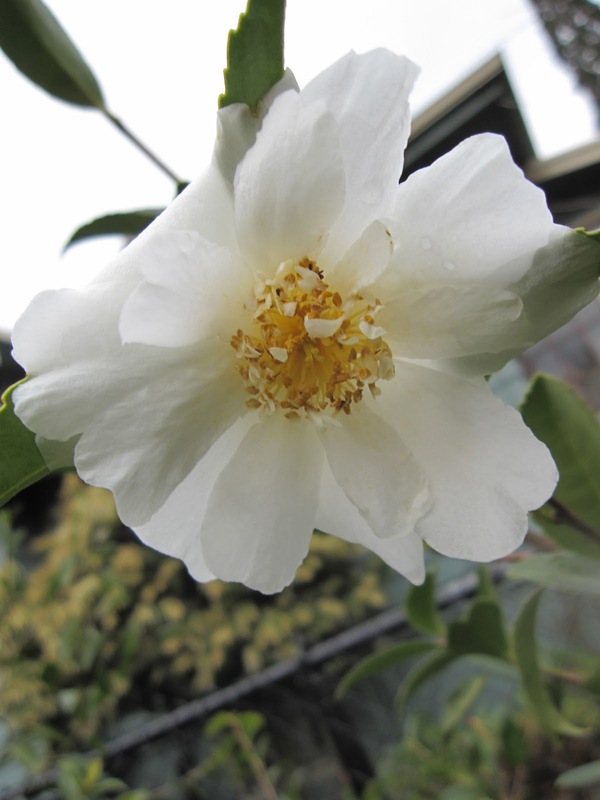 Camellia x 'Winter's Snowman' continues its show from the past few months. I'm glad the plants have decided to bloom well into the new year...that's when I need and really enjoy them the most. 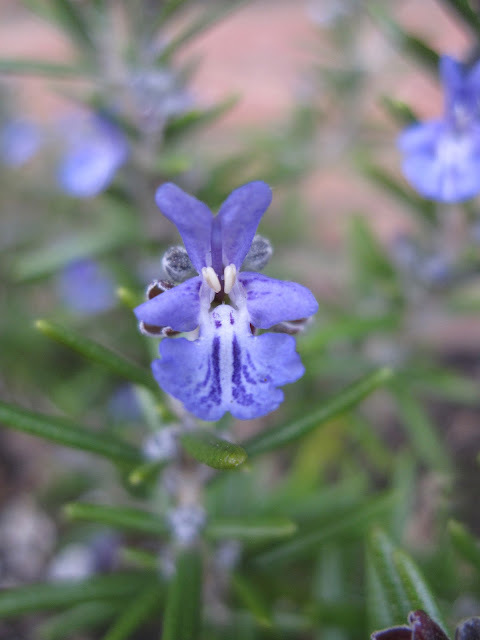 Little Rosemarinus prostratus 'Bonnie Jean' is making tiny purple-blue flowers. Even when temperatures are considerably colder, Rosemary is a winter performer. Vaccinium ovatum 'Thunderbird' is just opening. The scent of Sarcococca hookeriana var humilis is perfuming my front garden and doorway. These tiny flowers are hardly noticeable, but their powerful scent can't be missed. That's it for Bloom Day here at Longview Ranch. 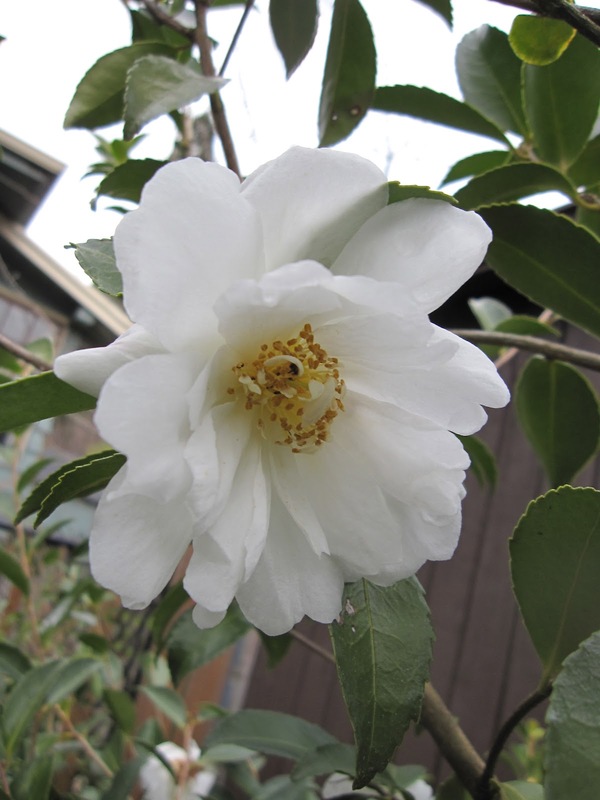 Click over to our host, Carol, at May Dreams Gardens to see what else is in bloom today. Happy Bloom Day!